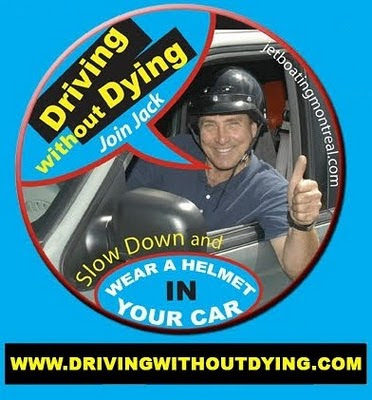 It's no secret that we're big fans of helmet campaigns for motorists. It would do wonders for reducing car traffic and encouraging people to ride bicycles. We've previously blogged about the first Motoring Helmet, developed in Australia in the late 1980's. Later we covered the Protective Headbands for Motorists developed at the University of Adelaide on the background of an Australian government study that showed that many lives could be saved and serious injuries reduced if car occupants wore helmets or similar devices. We added a blogpost about the headbands here. "There are giant gaps in highway safety that need to be filled. My legacy to humanity is to change the driving habits of the entire world and I don't care how long it takes." The man sounds committed. Check out his website. You can even translate his 10 Reasons to Consider Wearing a Helmet While in Your Car into other languages and send them in. In addition, this chap also has www.SafetyTuque.com - 'tuque' being a Canadianism for ski hat. He argues that you should acquire one because, among other things, "Crossing busy streets and falling on icy sidewalks are commonplace dangers for everyone when the snow is flying." Not to mention "Falling ice and snow off large buildings have been known to strike many unsuspecting pedestrians." "If helmets should be mandatory anywhere it's inside cars. Driving is the only thing most of us do that's really dangerous, with almost 50,000 deaths a year in North America. Going for a drive is like going to war - and we should probably wear combat helmets - especially teenagers". Josh Freed, The Gazette, Montreal, 17 February 2007. What do you think? Is Jack on the right track? The only reason that the two Australian motoring helmets never made any real impact is that the automobile industry wouldn't touch them with a ten-foot pole. It would be a catastrophe for sales if we started telling people that driving is dangerous. 1.2 million deaths a year and many more injuries. Goodness, no. That's bad marketing. Should the bicycle crowd back Jack's quest? We've had a poll running for a while here on Copenhagenize.com. It got buried in older posts, but's lets keep it running.